There are lots of Celebrity Lookalike Chickens out there. Everyone with Sultans, for instance, seems to have one named Lady Gaga–we think Silkies would be great Lady Gagas, too. Mae West is a common name for the uncommon Silkie Showgirls. And Phyllis Diller seems to be a name that gets used a lot with various unusual breeds, too. It’s fairly clear to me that it’s mostly the breeds with unusual plumage who get the “Celebrity Lookalike Chickens” treatment—especially when those breeds are crested. Those crazy crests just read nicely as crazy hair-dos or costumes. (Feathered legs don’t translate as well… not until there are more celebrities known for parachute or harem pants, I suppose.) But bearded breeds have potential as Celebrity Lookalike Chickens, too. We have one that we think you’ll particularly enjoy. We think they’re soul siblings, separated at hatch! Tell us what you think: do they look alike or not? Separated at Hatch: Conan O’Brien and Tolbunt Polish chicken. We think it’s a great match! They have the same color feathers, er, hair—although clearly the Tolbunt Polish has white in there, while Conan O’Brien has none to be seen. And they both even have beards. How cool is that? We think the beaks may even match. 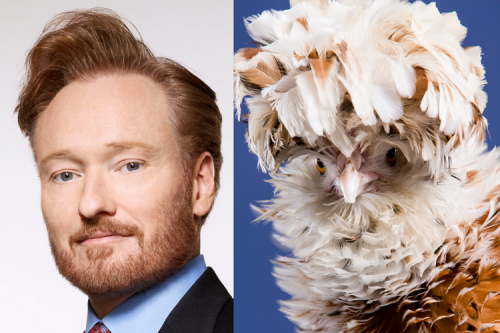 Please let us know if you think Tolbunt Polish birds are good Celebrity Lookalike Chickens for Conan O’Brien–or if you have a better suggestion. Do you have a good “separated at hatch” chicken/celebrity combo you’d like to share? If you have photos, you can share them with us on our Facebook page (alas–the comments section below doesn’t allow photos to be posted). In particular, we think there has to be a good Donald Trump chicken breed out there. Do you think there’s a breed with the same hair-do as Donald Trump? Donald Trump would probably be a buff laced Polish,non-bearded.